MARRI’s latest Research Synthesis paper, The Effects of Divorce on Children, discusses the myriad ways in which divorce directly and indirectly hurts children. · Family: The parent-child relationship is weakened, and children’s perception of their ability (as well as their actual ability) to develop and commit to strong, healthy romantic relationships is damaged. · Religious practice: Divorce diminishes the frequency of worship of God and recourse to Him in prayer. · Education: Children’s learning capacity and educational attainment are both diminished. · The marketplace: Household income falls and children’s individual earning capacity is cut deeply. · Government: Divorce significantly increases crime, abuse and neglect, drug use, and the costs of compensating government services. · Health and well-being: Divorce weakens children’s health and longevity. It also increases behavioral, emotional, and psychiatric risks, including even suicide. 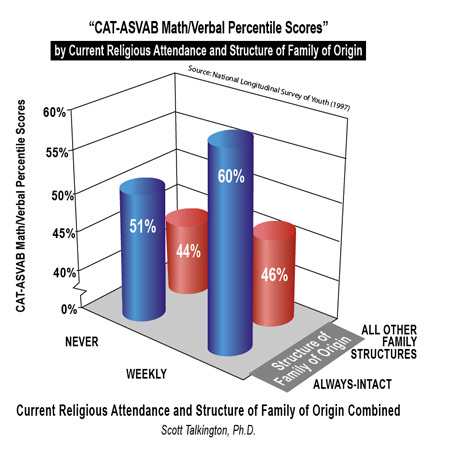 Math, Marriage, and Church- What’s the Connection? 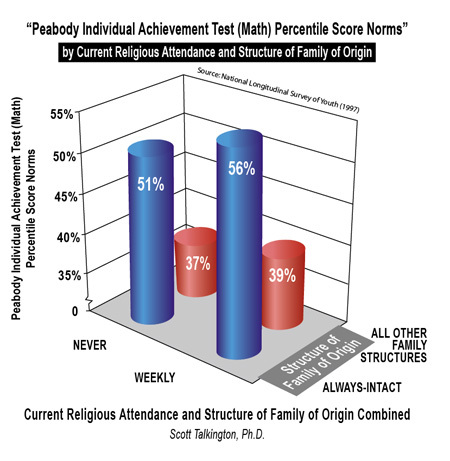 Our latest Mapping America (110: Children’s Peabody Individual Achievement Test math percentile norms) shows that children who attend church weekly or more often and who are raised in intact families rank in the highest PIAT math percentiles. 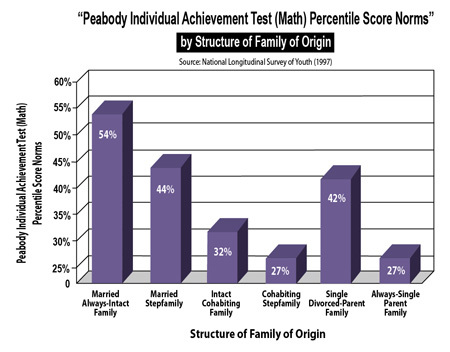 The strongest effects appear to proceed from family structure: children raised in intact married families average in the 54th percentile, while children raised in cohabiting stepfamilies or always-single parent families score the worst, averaging in the 27th percentile. Keep tabs on marri.frc.org for more Mapping America productions!